Introducing the Indochino Deco Collection and your chance to win a free Indochino suit! The new Twilight cast? No, the Indochino Deco Collection 2012. Yes, long title, but there is also a lot to talk about. It's been a while since Indochino's last big collection, but now it is here and it's a big one. The Deco Collection consist of 14 new suits & blazers, 2 coats, 8 shirts, finally and just at the right time, 6 wool ties and a couple of glittery accessories. 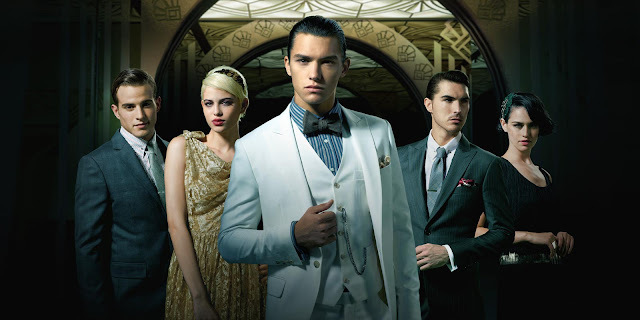 Indochino has moved on from the Superhero theme and dives right into the 1920s. Great patterns, heavier fabrics including both flannel and tweed, bold linings (100% silk!) and, similar to what we had with the Superhero Collection, lapel pins. Photos are really well done again, the settings are excellent and the suits appear great. Yes, I do like this one a lot and the theme appeals to me quite a bit more than the Superhero one. Before I go into details about some of the standout pieces, I quickly want to refer to a recent review of Indochino done by bespoke tailor Jeffrey Diduch. Read the review, I think it's a great example of how Indochino improved over the last years and where they stand now. Let's take a look at some of the standout pieces. As for suits, the single one I probably like most is The Bootlegger Blue Tweed Suit pictured below. 100% Australian Merino Wool, Super 100s fabric, very nice texture and colour. Sells for 399$, a fair price I think. The Mack Red Melange Toggle Coat is another interesting piece. Italian wool, great colour and texture and an interesting design. Surely not for everybody, but worth considering if you want something more special. The Bruno Brown Blazer below looks cool too, very versatile piece. Lots of other good suits and blazers and I'm sure everyone has a personal favourite. It's not quite christmas yet, but I still have a bunch of goodies waiting for you guys. There is a voucher for an Indochino Essential Suit (pay difference for higher priced suit)+ shirt + tie (valid until September 27th) and 2 vouchers worth 80$ each for Ministry of Supply. What do you have to do for a chance to win? It's easy enough. Step 3) I will then randomly choose a winner (it's not a competition of who looks best or who said the nicest things) and send you the voucher via email. 1st place gets the Indochino voucher, places 2 and 3 the Ministry of Supply vouchers. Please make sure you leave a valid email address when you comment or if you login via Twitter or another social profile I can reach you too. Step 1 will be checked for the 3 winners. The competition will run for 3 days and ends on September 21th, 00:00 PST. I wish good luck to all participants.